The Pond, contains three squidgy tiddly toys - just right for tiny babies and tots. 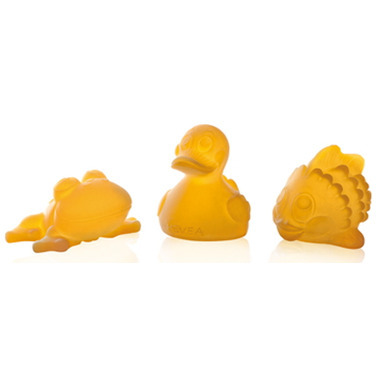 Hevea bathing toys are soft and malleable, yet durable. It’s easy to grasp and squeeze for even the tiniest hands, encouraging baby’s all-important early development skills. The toys look a little nicer in the photo but overall it's just what I was looking for. I feel comfortable giving these to my son to play with. These products are durable, yet flexible for baby's little hands. They are made of good quality material that I feel safe giving to my child.